4 We were broadcasted on TV!! Have you ever heard of WWOOF? The information below is taken from the official WWOOF JAPAN Website. WWOOF is an interexchange between people, with no money involved. 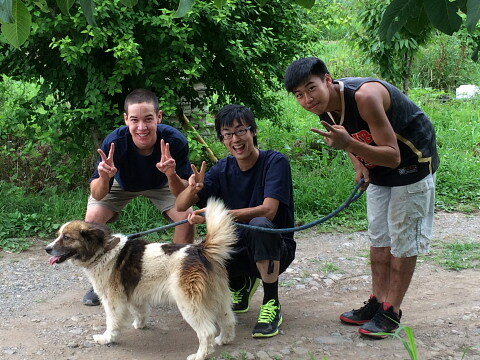 Every year, approximately 50~80 people come to our farm. From ages young as 16 years old up 70 year old come and help us with our WWOOF. Not only from numerous districts within Japan, but over 20 countries from around the world come here to Azumino, where we are located, to live in the same atmosphere and experience agricultural jobs. People as far as from Brazil to as close as people in the same town visit our farm. we think that our community spreads out through these people who come all the way from different parts of the world to experience our farm. Experiencing different seasons first hand, actively moving your body in nature unlike everyday, eating meals together as one, a place for people to meet and mingle. We have become a place where you can make memories like such everyday, which you would cherish forever. There are WWOOFers, people who come for WWOOFing, who visit us repeatedly, as well as people who come to live here because of their love for our town, with people contacting us to tell us “we got married!” or “we have a new baby coming!” Such interactions are a great bliss for us, giving us happiness from time to time. 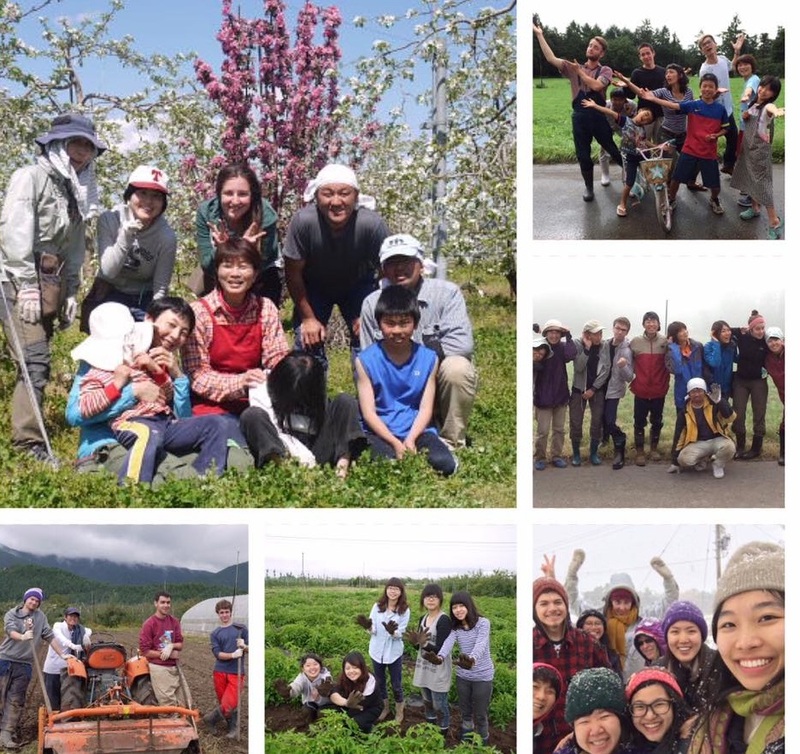 On the WWOOF JAPAN Page, we have posted examples of helping task contents conducted here at Ogurayama Farm. Depending on the seasons, these tasks may change. Scattering chaff onto orchards, etc. Raising and planting vegetable seeds, etc. Weeding and cutting grass, etc. We were broadcasted on TV!! We were introduced on a TV show called 「信州発見」, meaning “Found on the lands of Shinshu”. There is a video of it so please watch it if time allows. Like this, we share our living and helping space together. 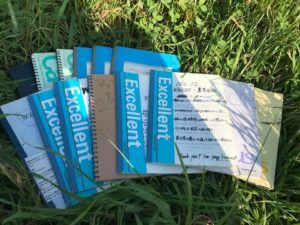 The photo below shows over 10 notebooks that are filled with comments from WWOOFers. The comments filled with thoughtful, heart-warming feelings make us overly happy. This is an example. Some are written in English, in Japanese, some even accompanied with small drawings. I will introduce one of these. more valuable than the normal sightseeing tours. The days I learned new things will be unforgettable memories as well. About the food, it was very pleasing. When I go back to America, I will make Okonomiyaki, Curry, Takuann, Rice balls, Umeboshi, and Miso for sure. The time when Terumi-san took me to make Miso was one of the best memories ever!! Being able to see that the Matumura Family were truly enjoying their living from the bottom of their hearts was charming, and wonderful. Like the family does, I also loved the fresh vegetables and fruits. I would love to live in an environment like this in the future. Thank you Akio-san for answering any and every question I had. I learned so much about agriculture during my stay. The days I spent were satisfying and comfortable. Akio-san, Terumi-san, Fuwa, Wara, Towa, and the staff members Hide-san, Etsuko-san, Imai-san, thank you so so much. Thank you to all the WWOOFers I met as well. I cannot express my gratitude with only words, but thank you for everything! ARIGATOU GOZAIMASU! Dear my loving family, the Matsumura Family. If you sign up for WWOOF, you can use your account for a whole year. There are WWOOFers who travel to many prefectures through different hosts, as well as WWOOFers who travel on weekends only. At our Ogurayama Farm, we are looking for WWOOFers who can stay over a week. We are also happy to accept long term stays as well. 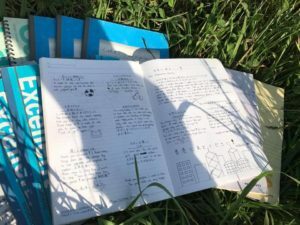 If you are interested in farming, wanting to experience agriculture, or just want to live in a different environment, I strongly recommend you sign up for WWOOF. Our host number is h3055.